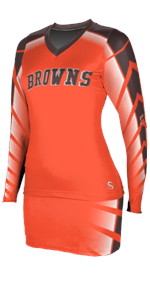 We're having a huge sale this month on our Sublimated Cheer Uniforms! Over 30% off plus we are not charging extra for ladies sizes! 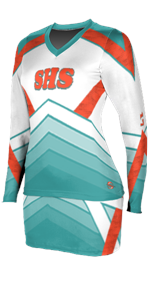 Our sublimated cheerleading outfits are made with a high quality fabric and the design is printed right into the material. These are made quickly in just 2 weeks! Unbelievable turnaround for these great uniforms! 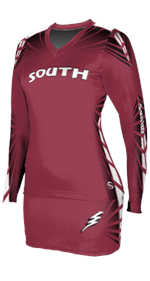 Our team has worked with Teamwork's ProSphere sublimation team since they started several years ago. And we've worked with cheer coaches over 26 years! 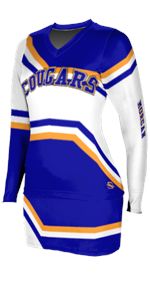 It's easy and fun to design your cheerleading uniform. You need to be on a regular computer or laptop for best results, if your phone isn't showing you everything. Click on any design below for more information, then click on the ProSphere designer link. Near the top of the Teamwork page, click on SPORTS. Choose CHEER to get started with your design! To place your order, enter your retrieval code on our page and continue through the checkout. We will review your design and contact you before submitting it to production. Disregard the prices shown on the designer pages. Our sale price is much lower this month!